Leftovers. I know I waffle on about this a lot but I’ve been thinking about it more recently and have made a distinction. I like leftovers that I have a definite plan for, cold roast chicken for sandwiches or to be used in a curry. Lamb shoulder that can be stuffed into pitta bread and dressed with tzatziki. Leftover pork shoulder to accompany some Mexican beans. You get the idea. The kind of leftovers I’m not so keen on are things like the noodles Stephen mentioned last week or the ends of the different kinds of pasta shapes that aren’t quite a whole serving but can’t easily be combined because they require different cooking times. The olives for this puttanesca are the kind of leftovers I don’t like. We used some olives in Sunday’s lamb dish and had half a jar sitting in the fridge. These aren’t the good olives that are nice to eat alone but the cooking variety, that have a harsh, briney flavour until they’ve bubbled away with lots of other things for a while. We don’t cook with olives a lot and I knew that if I didn’t use them soon then they would find their way into the bin. The problem was, all I could think of to do with them was puttanesca which I discounted as dull. It doesn’t always have to be exciting though, sometimes we just need to eat something. Which is what we did last night. And it was nice. Not exciting but perfectly fine. (We don’t follow a recipe for this anymore but our version is based on Delia’s, just with more of everything). Subscribe to comments with RSS	or TrackBack to 'Puttanesca'. 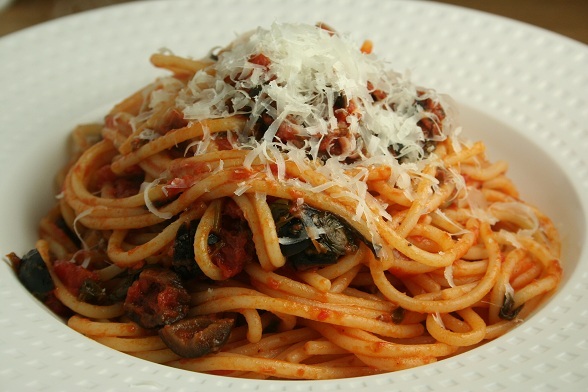 Puttanesca is delicious – perhaps not the most exciting, but a big plate of comfort.